April 14 at 7:00 p.m.
Join us in Miller Chapel on Sunday, April 14 at 7:00 p.m. for ”Palms to Passion,” a liturgical concert based on St. Mark’s Holy Week narrative featuring the Princeton Seminary Chapel Choir directed by Martin Tel and accompanied by Michael Gittens. This liturgical concert will feature readings from St. Mark’s passion account, choral anthems, and congregational hymns. 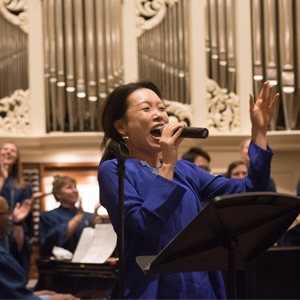 Included in the program are a Congolese-style anthem accompanied by drums and dance, a newly composed psalm setting by Michael Gittens, and an improvisation on the spiritual, “Were You There,” performed on electric guitar and organ. Other represented composers include William Mathias, Kyle Haugen, Mark A. Miller, Elaine Hagenberg, Daniel Gawthrop, and Karen Marrolli. All are invited to experience this musical exposition of Holy Week.